Proper operation of a transmission or distribution line is highly dependent upon the proper working of insulators. A good insulator should have a good mechanical strength to withstand the mechanical load and stresses. It should have a high dielectric strength to withstand operating and flashover voltages. Also, an insulator must be free from pores or voids, which may damage it. Therefore, to ensure desired performance of insulators, each insulator has to undergo various tests. 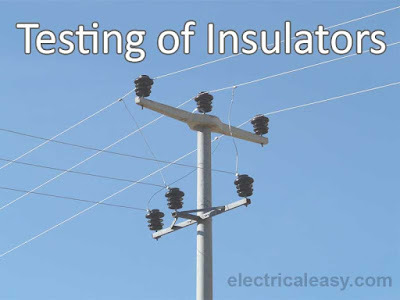 Following are the different types of tests that are carried out on overhead line insulators. Three types of flashover tests are conducted before the insulator is said to have passed the flashover test. The insulator to be tested is mounted in the same manner in which it is to be used. Then, a variable voltage source of power frequency is connected between the electrodes of the insulator. The voltage is gradually increased up to the specified voltage. This specified voltage is less than the minimum flashover voltage. The voltage at which surrounding air of the insulator breaks down and become conductive is known as flashover voltage. The insulator must be capable of withstanding the specified voltage for one minute without flashover. In this test also, the insulator to be tested is mounted in the same manner in which it is to be used. Similar to the above test, a variable voltage source of power frequency is connected between the electrodes. Additionally, in this test, the insulator is sprayed with water at an angle of 45° in such a manner that its precipitation should not be more than 5.08 mm/min. The voltage is then gradually increased up to the specified voltage. The voltage is maintained at the specified value for 30 seconds or one minute and the insulator is observed for puncture or breakdown. If the voltage is maintained for one minute, this test is also called as one-minute rain test. This test is to ensure that the insulator is capable of sustaining high voltage surges caused by lightning. The insulator under test is mounted in the same manner as in above tests. An impulse voltage generator which generates a very high voltage at a frequency of several hundred kilohertz is connected to the insulator. This voltage is applied to the insulator and spark-over voltage is noted. The ratio of impulse spark-over voltage to spark-over voltage at power frequency is called as the impulse ratio. This ratio should be approximately 1.4 for pin type insulators and 1.3 for suspension type insulators. In this test, the insulator under test is first heated in water at 70° for one hour. Then the insulator is immediately cooled at 7° for another hour. This cycle is repeated three times. Then the insulator is dried and its glazing is thoroughly observed for any damages or deterioration. The purpose of this test is to determine the puncture voltage. The insulator to be tested is suspended in insulating oil. A voltage is applied and increased gradually until the puncture takes place. The voltage at which insulator starts to puncture is called as puncture voltage. This voltage is usually 30% higher than that of the dry flash-over voltage for a suspension type insulators. In this test, the insulator under test is applied by 250% of the maximum working load for one minute. This test is conducted to determine the ultimate mechanical strength of the insulator. This test is conducted only for suspension type insulators. In this test, a tensile stress of 250% of maximum working tensile stress is applied to the insulator. After this, the insulator is tested for 75% of dry spark-over voltage. In this test, a freshly manufactured insulator sample is broken into pieces. These pieces are then immersed into a 0.5% to 1% alcohol solution fuchsine dye under pressure of 150 kg/cm2 for several hours (say 24 hours). After that, the pieces are removed from the solution and examined for the penetration of the dye into it. This test indicates the degree of porosity. 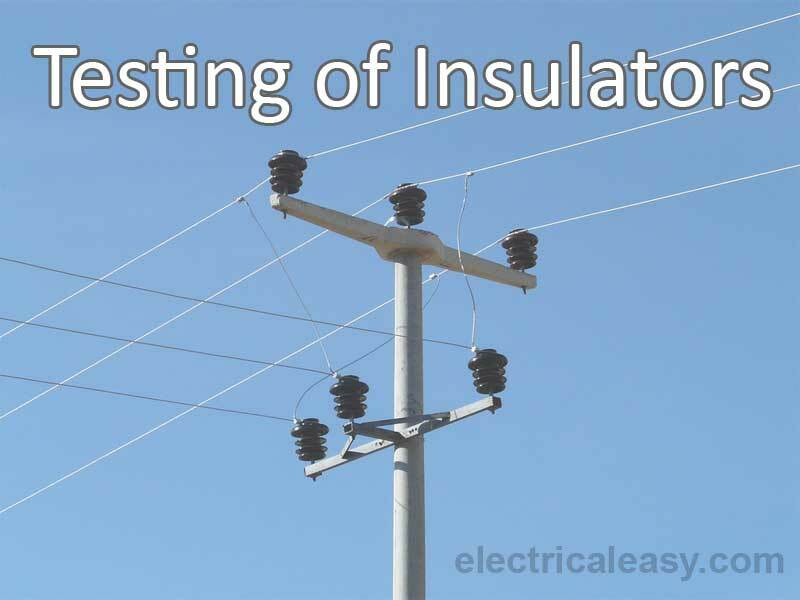 This test is usually carried out for pin insulators. In this test, the insulator is inverted and placed into the water up to the neck. The spindle hole is also filled with water and a high voltage is applied for 5 minutes. The insulator should remain undamaged after this test. In this test, each insulator is applied with 20% in excess of working mechanical load (say tensile load) for one minute. The insulator should remain undamaged after this test. In this test, the insulator with its metal fitting is suspended into a copper sulfate solution for one minute. Then the insulator is removed from the solution and wiped and cleaned. This procedure is repeated for four times. Then the insulator is examined for any metal deposits on it. There should be zero metal deposits on the insulator.